Buddy is an impressive dog in more ways than one. At five years old, the lovable Newfoundland weighs an incredible 206 pounds. (On more than one occasion, he’s been mistaken for a black bear.) However, despite his fierce size, Buddy is calm and friendly in temperament. A gentle giant, he has brought joy to many in Great Falls. Though Bill is technically Buddy’s owner, he refers to himself as Buddy’s driver. The dog is the main attraction he says; Bill’s just there to get the star to his appointments. Among his various community duties, Buddy is a greeter at the Lewis & Clark Interpretive Center. Bill was asked to bring him in because Meriwether Lewis had a Newfoundland on the Corps of Discovery’s cross-country expedition. 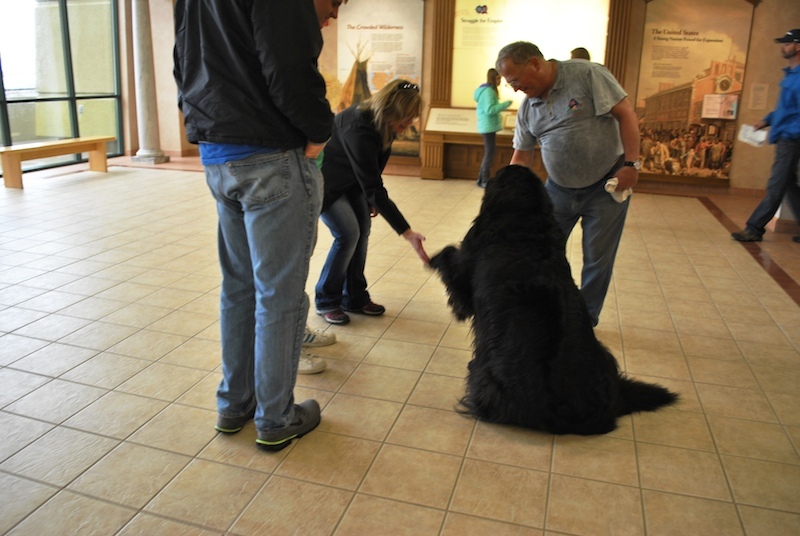 Buddy’s presence enables visitors to better imagine what the trip was like (and a big, fluffy dog is always a crowd pleaser). Since Buddy started greeting in July 2016, he has put in over 500 hours of service. He even received a commemorative coin during the National Parks Centennial in recognition of his efforts. Along with being the Interpretive Center’s unofficial mascot, Buddy is the mascot of Our Lady of Lourdes’ youth group. Perhaps his most important roll, however, is serving as a therapy dog at Hospice. “Buddy will sit down right next to someone. You can pet him for an hour and he won’t move,” says Bill. He and Buddy took a twelve-week course in Alaska that taught the fundamentals of connecting with hospice patients. They’ve formed a lot of relationships because of it. Bill has found that at the end of their lives, comfort is what people want most. And that’s something Buddy certainly provides.